Natural zirconia beads faceted. Size 3 mm is available. These are not the chinese zirconia. These are the natural zirconia stone and are off white shade. Small size is prepared to keep the per string cost low. 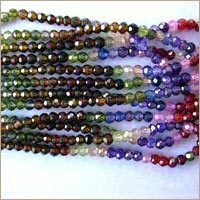 Each and every facet can be seen easily. - Cost effective High Density microgrinding media. - Suitable for grinding highly viscous applications. - Very High Wear Resistance gives high life and reduces product contamination. - Can be used in most Verticle and Horizontal aggitated bead mills e.g.-Sand Mills, Bead Mills, Basket Mill etc. We are offering Zirconium Beads to our clients. Zirconia Mini Media for Ink, Pharma, Mineral and paint industries. 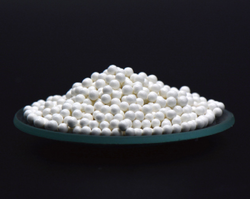 Yttria Stabilised Zirconia Beads used for wet grinding and de-agglomeration applications. The RIMAX does NOT contain any abrasive Alumina. It is a cost-effective replacement for Alumina and Glass Beads. RIMAX is the best inits category, in terms of 'Bonding' Strength and Low wear of Mill's Parts.